We’ve experienced modest success with our content, to the point where people ask me for tips on content marketing. We went from $0 to generating $10,000 in revenue almost purely with content marketing. With what I’ve learned along the way, I’ve boiled how I think about content marketing down to one key approach. What’s true for your product is true for content. The hardest part of starting a company most likely is acquiring your customers. The hardest part of starting a blog is acquiring your audience. Distribution is the limiting constraint. Start there. Thinking distribution first means framing all of my thinking with respect to content around distribution. Here’s how I think about content marketing viewed through the lens of distribution. 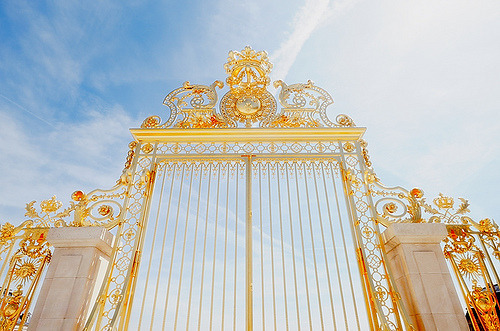 Is the distribution channel democratic or does it have a gatekeeper? Reddit and Hacker News are two great places to start distributing content, because they are democratic. Compare that with getting published on Forbes where you have to go through a gatekeeper like an editor or a PR firm to get written up. One trick that I’ve used successfully is simple but effective: prove your success elsewhere, then go waving it around to everyone you can find. Here’s an example of a pitch I sent to Alyson Shontell at Business Insider that resulted in the publication of a guest article about bossless startup company cultures. Hey Alyson! I wrote an article about how top startups build boss-less cultures that was near the top of Hacker News and that 10,000+ people read. Would you be interested in a guest post on the topic? I’d tighten it up and add more examples from top startups like Skillshare and Stripe. It’s a hot topic in the startup world, as startups aren’t only disrupting industries, they’re reinventing how companies are built and organized. Here’s a related trick that plays off of the same dynamic: When you write a successful post, it will inevitably get tweeted by other tech journalists and the content of the post will make its way into other pieces. I reach out to those journalists with “(iDoneThis)” or “(iDoneThis founder)” in the email subject with just one thing to say—”Thank you”. Later, if I think I have something of interest to them, I’ll send them a followup email using the same email thread. This works because I am sincerely incredibly grateful to have people mention us and share our articles, and their sharing of the article qualifies their interest and knowledge of who we are and what we’re about. Finding a relevant distribution channel that’s democratic can help the no-name founder bootstrap these processes. Will the distribution channel give you a one-time boost, or can you turn it into a repeatable process? PR is often denigrated because it’s often either expensive or not repeatable. In other words, it only becomes repeatable by spending money in amounts that are likely per customer greater than customer lifetime value. The main reason for this is because PR is based on personal relationships. There’s a place where the distinction between content marketing and PR blurs, and that’s what I would call the “business development” approach to content marketing. The idea mirrors the distinction between sales and business development: either sell one widget at a time, or make a distribution deal for someone to sell widgets for you. You can either pitch one journalist and get one story at a time, or you can pitch the editor and make a single deal for them to publish your articles for you. Once you get knee deep in this, you see how content publishing on the internet works. Business Insider publishes Inc articles. 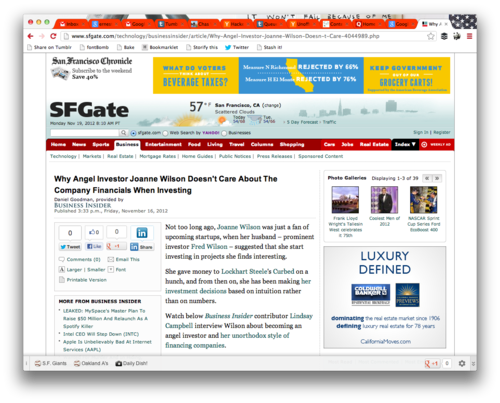 SFGate publishes Business Insider articles. And on and on. There is nothing these machines crave more than content, especially content that’s qualified as being the stuff that their audience will like. In my experience, a business development deal in this context takes one of two forms: a guest posting gig or a republishing agreement. A guest posting gig means that you have to write original content and you may have to get approval for it, but you have a relationship with the editor and the publication so that your content will get published on a reliable basis. Nevertheless, a word of caution: this is not for the faint of heart. Leo Widrich of Buffer, who is basically the god of guest blogging, got Buffer to 100,000 registered users almost entirely via guest posting but he did that while producing 1-2 blog posts every day for months. Republishing means not having to create new content and possibly not having to submit the articles for approval if the republishing process happens programmatically. To make these deals happen, it’s helpful to think like a biz dev person. How do I get a warm intro to a decision-maker? What’s my angle/edge? What’s their interest? What’s my value prop? What’s my social proof? What’s my success story? Who is my audience, and how do they consume content in this channel? Know your audience, as the old adage goes. Focusing on distribution forces you to think about who you’re writing for—potential customers, potential partners, potential investors, etc. Thinking about your audience will help you to choose the appropriate distribution channels. Looking at the intersection between who the audience is and what kind of content succeeds in that distribution channel is vital to crafting content that will also succeed in that channel. There are a few dimensions along which content can be crafted in accordance with how the audience consumes content within that channel. For instance, images do really well on Facebook while quotes do really well on Twitter. Longer thought pieces do well on Metafilter and Hacker News, while skimmable articles (tools posts, tips posts, etc.) do well on Inc.
On a more basic level, you can’t leverage Pinterest as a distribution channel unless you make your content an image; you can’t leverage YouTube unless you make your content a video; you can’t leverage Slideshare unless you make your content into a slide deck. A mistake that we’ve made that I often see is using automation to crosspost the same content to multiple channels. When Twitter posts get crossposted to Facebook, what you’re left with is Facebook posts with Twitter syntax that’s nonsense to most Facebook users and looks horrible because of the lack of syntax highlighting. Twitter posts on Facebook don’t make use of the ability of Facebook posts to be longer than 140 characters, to share links without having the short URL clutter the post, and to have images appear as images on the Facebook wall, not as links. Sincerity and authenticity under this frame of thinking happens at the intersection of fidelity to the distribution channel and your company’s/product’s soul. When content isn’t tailored to the channel, what ends up happening is that you have a presence, but you don’t thrive. You don’t get much for your trouble. It’s not enough to exist in various distribution channels, it’s vital that you understand what content does well, how it does well, and why. It’s obvious that on Tumblr, for example, if you’re reblogged, more people will see your content because another person’s reblog means that they’ve reposted your article in their feed. Another basic of social media distribution is that if you have more followers, more people will see your content. 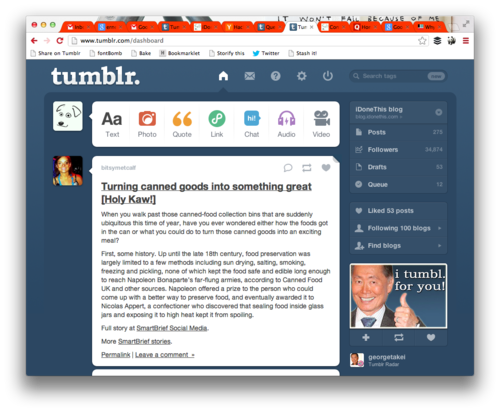 What’s less obvious is that on Tumblr, in the sidebar, if you hit “Find Blogs”, it will take you to the Spotlight page. (Perhaps, as well, you’re more likely to be a suggested follow if you’re a Spotlight blog.) Apparently a lot of people use this to find blogs to follow, because after being put on the Spotlight page, we went from having a few hundred followers to our current count: 34,000+ followers. We’re extremely grateful to Tumblr for that. There are endless opportunities to be featured—to be above the fold—and it can make a huge difference. In my experience, this involves figuring out the site mechanics that elevate content and connecting with the right gatekeepers. How do I capture my audience and build my own distribution channel? You have it best when people come straight to you for content, and you aren’t reliant on any channel for distribution. Part of the point of this article is that writing the content is probably less than half of the job in making content work for you—the other half of your job is getting distribution. When you’re able to distribute your own content, you have it good. One a basic level, this may mean putting a Twitter follow button and a Facebook like button on your blog. When you build up a following, you may get as much juice by pushing your content through your social media distribution as you would by getting the article published on Forbes. Another tactic that I’ve heard is effective is requiring an email address to access certain pieces of heavy duty content (like an e-book), and then using that email to push content. Also, I’ve heard that email newsletters with relevant, high quality content like Wistia’s newsletter do very well. When a site has gotten enough backlinks with relevant anchor text, your blog becomes a search destination. The harder part is building a real community. Hacker News is an example of a community that emerged out of a set of content’s shared themes. I started as a reader of Paul Graham’s essays and bought into the hacker ethos, and so I naturally became a member of the Hacker News community. Now Hacker News is a powerful platform for publicizing Y Combinator companies. They leveraged an audience into building a community. A community is much more powerful than an audience, because a community grows as it grows, but an additional audience member isn’t likely to mean an additional audience member. How do I create high quality content marketing in a scalable way? When distribution as a constraint begins to loosen, the hardest problem is producing great content over and over. One easy way to start is by taking a storyline that has proven to be successful in the past and rewriting it to suit different distribution channels. Take the interesting thread from the successful article and make it interesting in a number of different contexts. You can get pretty fast at this and produce content that you are certain is of interest to a lot of people in only a few hours. A related tactic that companies like Buzzfeed and Business Insider have turned into an art form is taking content that you’ve observed is successful elsewhere (e.g., Reddit), boiling it down to its essence (ie, taking the most interesting thing out of it and making it the whole article), sticking a killer title on the post, and watching the visitors roll in. Another tactic that I’ve observed (but haven’t tried) is what companies like Yipit and Seatgeek have done really well with. They use data from their platform to produce industry research that the fact-hungry press picks up. The press cites your stats over and over, and all you had to do was do research once. The bonus is that pulling the stats sounds like fun. However you accomplish it, the thing to be avoided is creating a hit-driven content strategy. We still experience considerable variance in the results of our content strategy, but it’s far less than when we first got started. Reliable distribution is the foundation to a repeatable model for effective content.